Get creative thanks to Bassett Stationery, whether you are a master crafter or are trying your hand at being artistic for the first time, we have everything you could ever need. Oil, Watercolour and Acrylic paint mediums, different pads for painting, sketching pads & books, sketching pencils, watercolour pencils, selection of paint brushes and more. I stock a large selection of peel-off stickers for use to make your own greetings cards, blank cards & envelopes for said project, paper toppers and decoupage and more. There is a huge selection of papers and cards for your various projects, in various sizes and colours. I also stock a range of arts & crafts products suitable from children, including gifts in a tin, painting by numbers, colouring books, googly eyes & much much more. 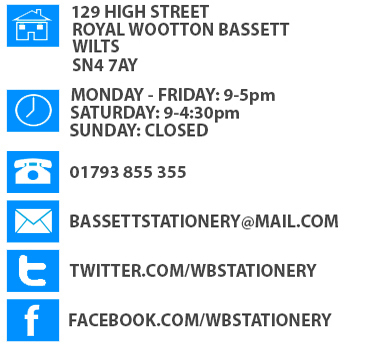 As with our stationery suppliers, if an item is not in store, we might be able to order it in especially for you. (depending on product/supplier. This does not include the next day delivery service included with all stationery orders and we cannot guarantee a fast turnaround time).